Walkers of all ages and abilities will be heading for the hills and exploring the local hinterland when the Sperrins and Killeter Walking Festival returns on Saturday 16th and Sunday 17th September 2017. The popular festival, organised by Derry City and Strabane District Council in conjunction with local adventure company Far and Wild, will host a total of six walks over the two days, ranging from easy family friendly strolls to moderate treks and challenging hill walks all led by professional walking guides. Speaking ahead of the event, Mayor of Derry City and Strabane District Council, Councillor Maolíosa McHugh, said it was the perfect opportunity to showcase the majestic local landscape to visitors and locals alike. “The Sperrins and Killeter Walking Festival has firmly established itself as a key date on the national walking calendar offering walkers the opportunity to get off the beaten track and discover the beautiful scenery our district has to offer,” he said. The festival begins with an early 6am start at the Pedestrian Bridge at the Melvin Sports Centre in Strabane on Saturday September 16th when the 4km long Easy ‘Dawn Chorus’ Walk will allow walkers of all levels to explore Strabane’s captivating greenway along the River Mourne to Sion Mills. Later that morning the Sawel Challenge at 9am will take more experienced walkers on a 12km hike through some of the highest peaks of the Sperrins before the Balix and Beyond 8km walk will allow more moderate ability walkers along a natural heritage site that links into the Murlough, Hollyhill and Legfordrum areas. On Sunday the action moves to the scenic landscape of Killeter where experienced local guides will impart their knowledge about the ecology, history and folklore of this wild and remote part of West Tyrone. At 9am the ‘Challenging the International Reach of the Killeter Camino’ walk from Killeter village will explore the international heritage links of the local area to the Camino de Santiago and the International Appalachian Trail. Later that morning the Water of Life walk will offer the opportunity to trace the flow of the River Derg and surrounding lakes as a life giving watercourse through Killeter and beyond. Finally the family friendly Pilgrim Trail from Killeter Village to Magherakeel and St Patrick’s Well will offer the opportunity to explore the old local route to Lough Derg where a host of local wild life including the Red Hare, Sparrow Hawks, Peregrine Falcons and the Irish Otter may be spotted. The Killeter Walks will begin at Killeter Community Hall while the meeting point for the Glenelly Walks is Watts Barr in Plumbridge. Registration for the Sperrins and Killeter Walking Festival is open now at www.sperrinskilleterwalking.com where full details of each walk are available. 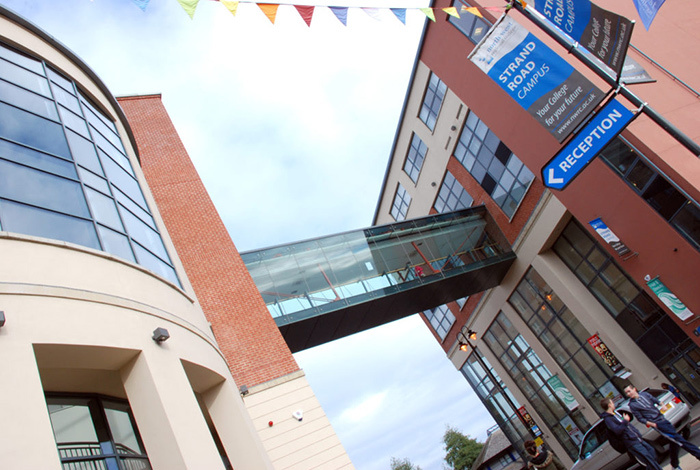 Derry City and Strabane District Council are seeking fresh applications for the summer intake of an innovative programme that helps prepare local unemployed people for a career in the hospitality, retail and tourism sectors within just five weeks. The Hospitality and Retail, Tourism Training for Employment course (HARTE) is part of Council’s Kickstart to Work programme and aims to provide candidates with the qualifications, skills and confidence to successfully apply for jobs in those sectors. The course aims to break down the barriers that unemployed people often face in applying for positions in the local job market by offering them pre-employment training to equip them with the necessary skills to make a successful job application. During the course Kickstart will offer financial support for expenses such as childcare, travel, subsistence and uniforms. The course is split into three sections: a vocational training programme at the North West Regional College, an award in employability and a two week work placement before offering candidates a guaranteed interview with local employers. Mena Kearney, Job Brokerage Officer with Derry City and Strabane District Council, said the course will provide applicants with the necessary qualifications and skills to take up a career in either hospitality, retail or tourism. “This course is aimed at unemployed or economically inactive people in the Council area who are more than capable of pursuing a career in these sectors but who may need some guidance and support to make their aspirations a reality,” she said. “As well as providing industry led accredited training and work experience, help and support candidates will also be offered assistance with job searching, CV preparation and interview skills to enhance their chances of securing future employment. “Some candidates may not have been part of a training programme for some time and they will find the one to one mentoring that is provided as part of the course particularly helpful. “We aim to breakdown all the barriers that are holding people back from returning to training and employment. Derry City and Strabane District Council’s Kickstart to Work aims to provide training, skills development and job opportunities to unemployed people who reside in the Council area by delivering a range of industry specific courses. Eligible candidates must be unemployed / economically inactive and reside within the Council area. Further details of the HARTE course is available by calling the Kickstart team on 028 71 308466 or emailing mena.kearney@derrystrabane.com. The joint bid by Belfast City Council and Derry City and Strabane District Council to secure the European Capital of Culture title for 2023 was endorsed today when the First Citizen of both cities boarded the Belfast to Derry~Londonderry 212 bus to officially encourage people to have their say and get behind the bid. Earlier in the day, the Lord Mayor of Belfast Councillor Nuala McAllister welcomed Derry City and Strabane District Council Mayor Councillor Maolíosa McHugh to Belfast City Hall, before travelling to Derry for the launch event in the Guildhall. Lord Mayor of Belfast Councillor Nuala McAllister says securing European Capital of Culture status would be a major coup for both cities, bringing not only a diverse programme of arts and cultural events with a strong European dimension, but the opportunity to deliver a range of positive outcomes including strong collaborative working between both cities, strengthening our European links, boosting tourism and growing the economy. 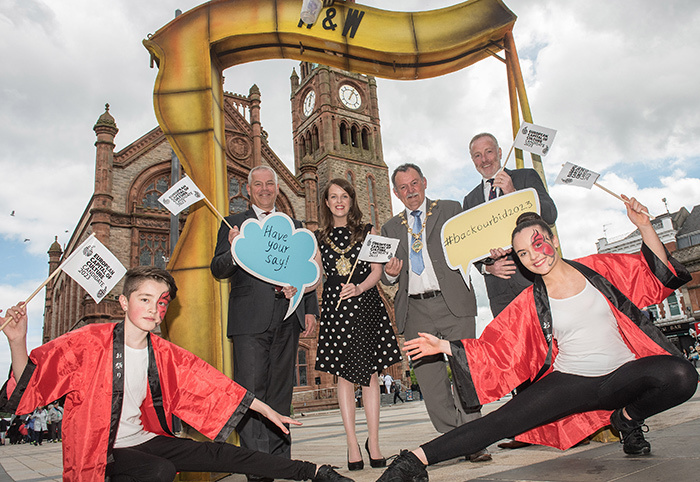 Earlier this year, Belfast City Council and Derry City and Strabane District Council announced plans to submit a joint bid for the European Capital of Culture title for 2023. The European Capital of Culture (ECoC) is an annual designation awarded by European Commission to nations inside and outside of the EU. Since it launched in 1985, 56 cities have hosted the title including two in the UK – Glasgow in 1990 and Liverpool in 2008. 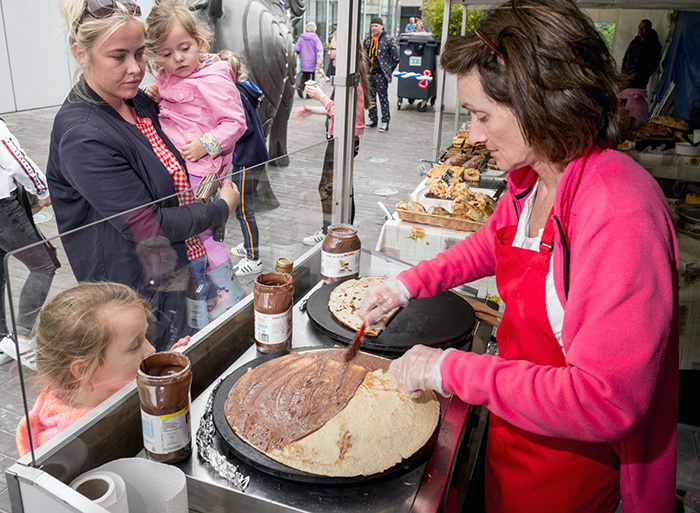 Dublin held the title in 1991, Cork in 2005 and Galway will be Capital of Culture in 2020. In 2023 the two countries hosting the title will be UK and Hungary. The bid team will be actively engaging with the public over the coming weeks and months seeking views and opinions and finding out what the general public want to see from European Capital of Culture status. The deadline for submission of the first joint bid document is 27 October 2017. If successful, a revised bid submission will be submitted and the team will embark on further public engagement, with the final bid to be completed by the summer of 2018 and the winner announced later in 2018. Derry City and Strabane District Council’s popular Kickstart 2 Work Angling course is seeking a new batch of applicants for later in the summer. The course at the Loughs Agency in Prehen is part of the Maritime Ambassador Programme and offers unemployed people living in the Council area the opportunity to learn the skills of fishing while gaining an industry recognised qualification as an Assistant Angling Course. The free course has been successfully running since 2015 and can be completed within five days in a relaxed, fun environment with people from a range of abilities. Project Officer for the Maritime Ambassador Programme at Derry City and Strabane District Council, Geraldine O hEara, encouraged local unemployed people interested in doing the course to make contact now to secure their place. “We are blessed with a number of beautiful, popular rivers and loughs in and around our council area, so the opportunity to get to know these while learning new practical angling skills in the beautiful surroundings of the Loughs Agency under the watchful supervision of experienced coaches, is a great opportunity. “We welcome applicants of any level, for those with no previous experience of fishing, participants will receive full training to achieve beginner level ‘CAST’ qualifications with the option to progress on to becoming a qualified Assistant Angling Coach. To be eligible for the training you must be over 18, unemployed, reside in the Council area and not enrolled in any other education or training. For more information on how to apply for the course contact Geraldine O hEara at 028 71 308466 geraldine.oheara@derrystrabane.com.